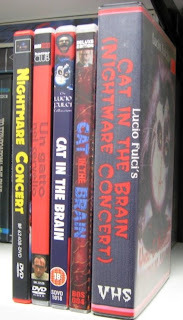 This is a follow-up of these entries, Cat in the Brain - Grindhouse Deluxe Edition and Cat in the Deutsch. I've tracked down yet another edition of Fulci's Cat in the Brain, this time the Minerva DVD from Italy snagged on the cheap on Amazon. Since the great looking full frame British DVD was sourced from Minerva's vault; I was very interested in seeing this disc being in the film's original anamorphic 1.66:1 widescreen ratio. Sadly, the results are a bit mixed. The transfer indeed carries the healthy grain seen in the British transfer, but is marred by weak compression and edge enhancement. Look at Fulci's suit outline in the first capture that exhibits thick haloing from the edge enhancement applied the image. This problem flattens the depth seen on the British transfer and makes any camera movement look subtly "laggy". So the top of the heap is still the Brit's Screen Entertainment DVD that's imperfect though lacks the annoying EE seen here. This Italian transfer bests Grindhouse's effort and let's not even consider the terrible German DVD at all. Of course, this all depends on if you trust me and how much of a Fulci diehard whose looking for the best picture quality on this film you are. I love Fulci and thought Cat in the Brain was an okay film, but Touch of Death (which much of the footage from Cat in the Brain is originally from) is in my opinion a far superior film. Brett Halsey is great and the film is as funny as it is gory.